The dark and malevolent forces of the Cthulhu Mythos mostly ignore humankind. But these entities are also shrewd opportunists. Many of them see humans as a resource to be harvested, corrupted or enlisted for their dark plots. Humanity, with all its noble aspirations, has many flaws. Greed, lust, envy, hatred and fear are ripe fruits for these forces to exploit. Division and separation makes the humans easier to control. While the best of humankind fights for just laws and civilization, those who cling to power and privilege stand ready to quash protections for those who need them most. In the shadows of human injustice lurk loathsome, inhuman entities. As investigators square off against the worst aspects of mankind, they also find themselves entangled with the parasitic powers of the Mythos. 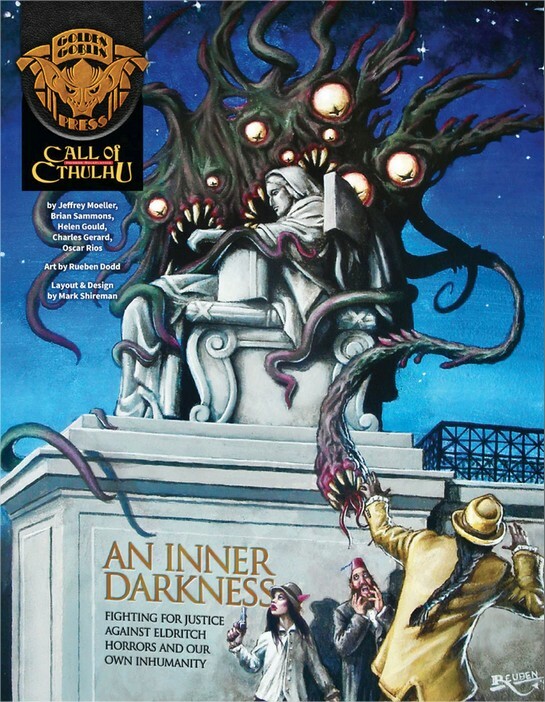 Welcome to An Inner Darkness, from Golden Goblin Press. When this Lousy War is Over, by Brian M. Sammons – Arkham, Massachusetts, 1923. At the local chapter of the Veterans of Foreign Wars association, men who fought in the “war to end all wars” gather together, seeking a bit of solace from those who’ve shared similar experiences. Many are wounded in body, in mind, and in spirit. Many suffer from horrifying nightmares, violent outbursts, disfiguring injuries, or alcoholism, but their pain and struggles are mostly ignored by society. They are reminded that the war is over, and told to just “get over it” by a public who finds it all too easy to judge. Then, chapter members start to mysteriously die in violent and terrible ways, with clues pointing to the occult, possibly involving a member of the association no less! Can the investigators find those responsible and stop them, before it’s too late? They Are From Away, by Charles Gerard - Bangor, Maine, 1923. Maine has become a major battleground for the Ku Klux Klan. Protestant nativists have grown fearful about the recent influx of Catholic Immigrants, mostly Irish and French-Canadians. This provides the KKK with fertile ground for spreading their message of hate, division, and violence. Enter Eugene Farnsworth, a charismatic former stage magician, hypnotist and filmmaker, now known as King Kleagle, the head KKK recruiter for Maine. He hosts “wholesome” public events while spearheading an aggressive recruitment drive, making alliances with area politicians and heads of industry. Meanwhile, macabre, inexplicable and unnatural events begin to occur, aimed at humiliating and terrorizing the area’s Catholic citizens. Investigators must discover if there is a link between the two, and find a way to stop it if they can. Fire Without Light, by Helen Gould - Tulsa, Oklahoma, 1922. Less than a year has passed since the Tulsa Race Massacre, when the wealthiest black community in the United States was destroyed and hundreds of innocent people were murdered by rampaging white mobs. Though most of the 10,000 black residents left Tulsa, some remained to rebuild their devastated community. Now tensions are on the rise once again. A new pastor and his wife have arrived, preaching hate and violence to the white population. Their congregation is growing at an alarming rate, and violence is spilling out from their church and into the streets. Strangely, even families and friends of the same race are turning against each other. Something very wrong is going on here. Investigators must tread carefully to discover just who - or what - is fanning the flames, pushing the citizens of Tulsa towards another wave of catastrophic violence. A Fresh Coat Of White Paint, by Jeff Moeller - Los Angeles, California, 1931. Early in the Great Depression, the U.S. institutes its first mass deportation policy, supported by a cross-section of interests such as racist nationalists, eugenicists, paternalistic "charities", and labor unions "looking out for their own." This leads to a roundup of thousands of ethnically Mexican families, many of them U.S. citizens, carried out federal employees, local police, various "charities", and outright vigilante groups. The deportees were (sometimes) given summary hearings, detained in makeshift conditions, and then loaded onto trains. On the outskirts of Los Angeles, one such "charity" is refurbishing an old prison to "give the unfortunates somewhere to stay." However, this long abandoned facility has a dark past, which is quickly becoming a horrible, otherworldly nightmare for those interred there. Can the investigators get to the bottom of things in time to save the prisoners? A Family Way, by Oscar Rios – New York, New York, 1925. The investigators must come to the aid of a dear friend, a student at Columbia University. She’s found herself "in trouble" after what should have been a harmless girls' night out. Her group ended up drinking and dancing with the wrong sort of fellas, the kind willing to slip them a mickey and take what they wanted from their unconscious victims. Now the girls need help, as the authorities won't act, or even take their stories seriously. These men have deep pockets, powerful allies, and dark secrets. When the men return with offers of marriage and gifts of strange, pale gold jewelry, it becomes clear they aren't the sort to take no for an answer. There aren’t many options for girls in their “condition”, and one of the few happens to be illegal. But your friend just wants this nightmare to be over, if such a thing is still even possible.